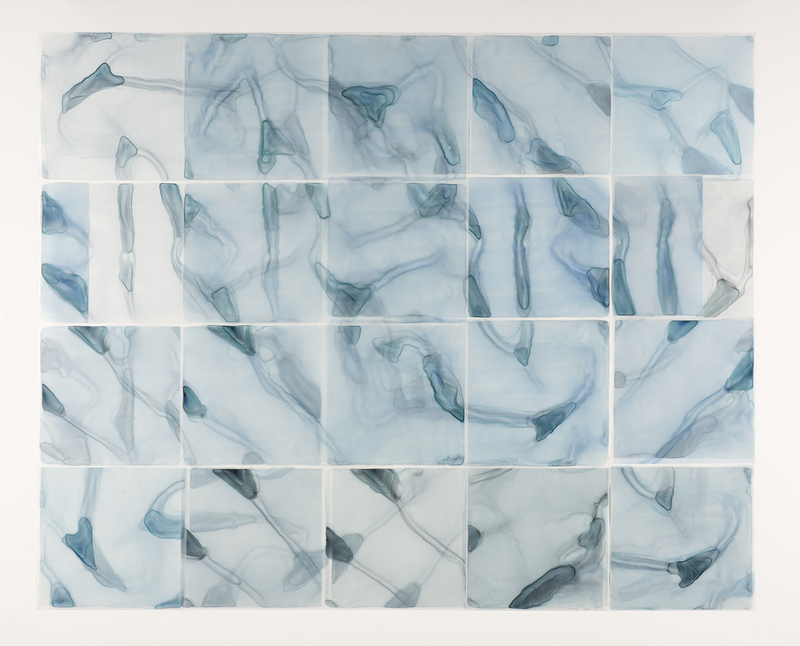 River:Flow:Chart #7, watercolor on translucent synthetic paper, 59"x41"
I'm pleased to announce that Gebert Contemporary will be exhibiting three of my River/Flow/Charts in a group show that opens Friday, July 15. The other featured artists are Udo Noger, John Nelson and Keiko Sadakane. Please join me at the opening reception from 5 to 7:00 or come by the gallery this summer. Gebert is on Canyon Road (behind Chiarosuro) and there is parking - though don't count on it for the reception. Water chart, watercolor on translucent synthetic paper, 56"x64"
In just a week I'll be at the reception for my show at SMINK in Dallas. 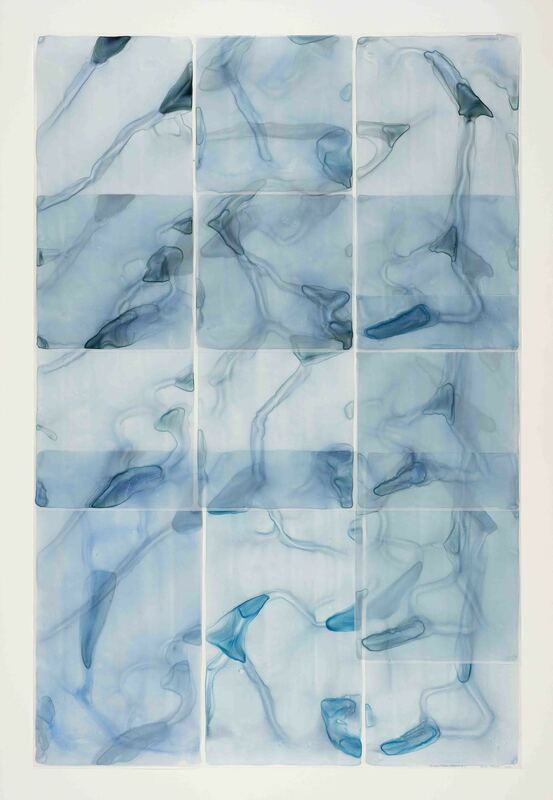 Jennifer Smink asked me to make something really big for the exhibition, and here it is - Water Chart - about 53 x 64." It was a great challenge to work on this scale, especially because the supports (foam core and mat boards) had to be specially ordered and everything took longer than I expected. Getting the whole composition to flow and connect and to balance depth with expanse presented new problem at this size. There are multiple dimensions to perceive here, not just height and width but layered depth, as some squares are three layers deep - hard to convey, really, in a photograph. Turquoise, teal, aqua, robin's egg, cyan, spruce - this range of cool blue-greens has been obsessing me for the last few months. Perhaps it's a reaction to the chaos on the front page news, and certainly reflects my inner need for balance and harmony. If color alone can heal, these hues are healing me. Untitled 2015/23 measures 40 x 41." At the the abstract level, it juxtaposes and combines two disparate presentations of the same flow pattern, circles (bubbles) and "puddles." It's intriguing to me that the similarities in the twin flow patterns - larger underlying shapes - is not immediately apparent, but the harmony between them is sensed. refreshing, feminine, calming, wholeness, creativity, emotional balance, spiritual grounding, love, patience, intuition. I have been thinking of the pleasures of tradition as I've been listening to new music at the Santa Fe Chamber Music Festival this summer. Yesterday, in particular, during a concert of works by young composers-in-residence, the new sounds elicited from classically trained musicians on their conventional instruments had my ears perking up. The music sounded both old and fresh, familiar and newly introduced. This dichotomy engages one's deep memories while surprising us into paying complete attention. Nothing, not rhythm, tonality, harmony or melody can be taken for granted, and yet the format (in this case) was the string quartet, as well-established as can be. Something similar operates in my paintings, with their traditional framed formats. 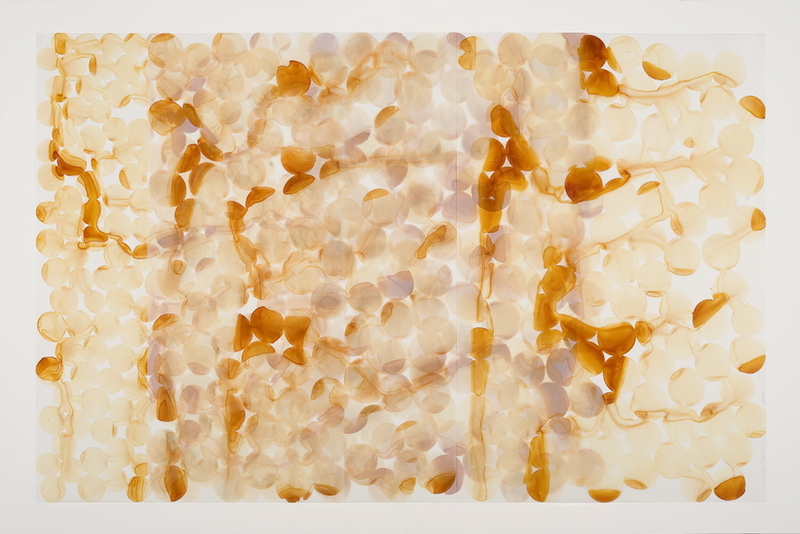 The watercolor medium still employs gum arabic from acacia trees and many of the pigments have been used for centuries, altho some are now synthetic. On the other hand, the translucent synthetic paper I use (Yupo) has only been available since the end of the last century, so the ability to layer transparencies is new, and Yupo's non-absorbent surface causes the paint to behave in unprecedented ways. Abstraction itself now has a grand tradition of over a hundred years but offers plenty of unexplored territory. Release #2/Wayne is another in the series of elegies for my husband. There's something about the color and softness, the upright format and upward-rising visual flow that feels to me like an abstract portrait of him. I've added a new page to this site, a "gallery"showing a selection of paintings from this past year. Altogether, there are over 30 Elegies and Releases. Not only was it important to honor Wayne's memory in this way, these were also the only paintings I could have made while grieving. The series has taken me into some new territory of emotional expression. Without any deliberation on my part, they reflect the range of my feelings and provide images of spiritual movement and change. As you will see if you click on the "Elegy" page button (above) I have also in some cases dropped the repetitive elements that have been mainstays for several years. This large painting, inspired in color by glorious autumn cottonwoods along the Galisteo River, has been selected for purchase by the Farmington Regional Animal Shelter. Facilitated by the New Mexico Arts, Art in Public Places Purchase Initiative, the placement seems so appropriate to the life-affirming mission of the shelter. I'm really pleased and proud to think of my work hanging there. Actually, they are buying two paintings, but I thought I'd show you this vibrant, exuberant one. Galisteo #2 was made in 2009, obviously a good year for cottonwoods. Looking at it again I'm reminded of how much my work depends on forces beyond my conscious control. Although I had no plan for this piece beyond the color, somehow it conveys a sense of trees in sunlight that is purely fortuitous. I find that the more I allow life, paint, events, to arrive of their own accord, the richer my experience and the better my art.